The Asterias Village Aparthotel is in a great location for exploring this beautiful part of Crete. The aparthotel is situated a mile from cosmopolitan Hersonissos and only 300 metres and 150 metres respectively from the beautiful villages of Koutouloufari and Piskopiano. The property is also a partner of the Crete Golf Club, an 18-hole championship standard course, offering a challenging and enjoyable experience. Guests of the of the Asterias Village Aparthotel benefit from special discount rates at the Crete Golf Club which lies approximately two miles south-west of the complex.The Asterias Village is made up of ten separate buildings spread over a 12.000 square metre area. In total the complex has 2 suites, 32 studios and 56 apartments. 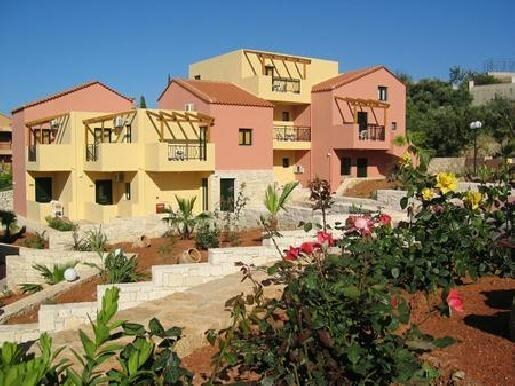 All have a kitchen area, a balcony or terrace, wireless internet access and satellite TV. Air conditioning and a safe are also available for a small fee payable locally.